Typically, your feeders serve as a supplemental food source for birds. In contrast, during periods of extreme cold and severe winter weather, your birds may switch to utilizing your feeders as a critical source of food that enables them to survive from day to day. So make sure your foods are worth their weight with quality high-calorie, fatty foods for the birds. You can play a vital role, as feeding the birds becomes critical when extremely cold conditions occur. At these times, a reliable supply of energy-heavy food can mean the difference between life and death for a bird. To stay warm, birds will expend energy very quickly, some losing up to 10% of their body weight on extremely cold nights. Food is the most essential element, providing birds with the energy, stamina and nutrition they need. An ample supply of high-calorie foods such as our new Winter SuperBlend, SuperSuet (coming soon), Bark Butter, sunflower, Nyjer and more is crucial to a bird’s survival. 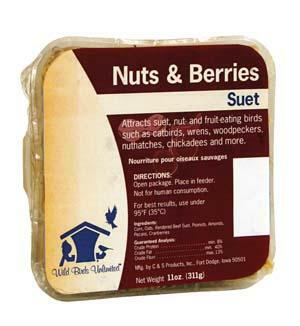 Suet as well as Jim’s Birdacious Bark Butter® and Bark Butter Bits are full of essential fat and protein helping birds, such as woodpeckers, chickadees, nuthatches, titmice, wrens and others, maintain their high metabolic rate. Nyjer is high in fat and protein, and a favorite of goldfinches, Pine Siskin and Purple and House Finches. 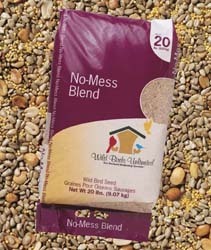 Our No Mess LM and Blends are loaded with sunflower and peanuts and millet. Millet is high in carbohydrates and is especially good for attracting ground-feeding birds, such as native sparrows, juncos, towhees, and doves. Or if you prefer no millet, our No Mess NMCD has sunflower chips, chopped and diced peanuts, and clacium. Bird food cylinders are a win-win for you and your birds. Cylinders, like Winter SuperBlend Cylinder, "Bug, Nut, & Berry", and "Nutty for Nuts", are long- lasting allowing you fewer trips to fill the feeder. 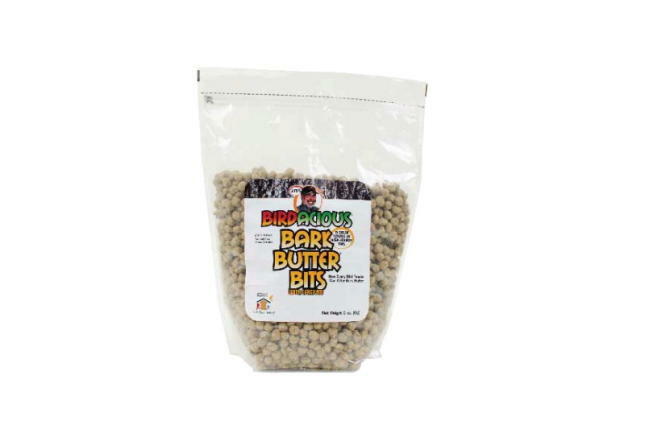 They are packed with high-calorie peanut, tree nut and sunflower energy to help the birds stay warmer. There are no shells, providing a quick energy snack for birds and no mess for you. So in order to meet your birds’ needs, it is important to have at least one foundational feeder that dependably provides food every day and does not have to be filled very often. Studies have demonstrated that a constant, and reliable source of supplemental food helps to improve the overall health and body condition of wild birds. Help your birds know your food is worth the weight by locating your foundational feeder in a sheltered location out of the wind and keep it full of the high-calorie, fatty foods that provide birds the crucial nutrition they need to survive and thrive even during the coldest times of the year. Stop by our store for more expert advice and quality foods that are worth the weight to help your birds thrive this winter.